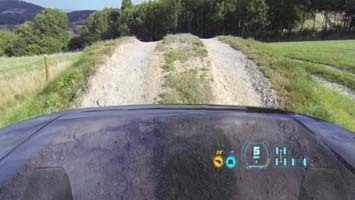 Out on the off-road trial, vision is key. And as the course contorts your vehicle in all sorts of awkward, angled positions, and normal visibility changes, there are only a few ways to see what’s ahead: post your buddy out on the trail or lean your head out the window. For a true gentleman off-roader, though, none of those solutions is ideal. Luckily, Land Rover has a solution – Land Rover’s Discovery Vision Concept, which will debut at the New York Auto Show next week, will demonstrate brand’s new “Transparent Hood” technology. Amazingly, it works just like how it sounds. Cameras mounted in the front of the vehicle feed live video to a smart windshield, which projects a vehicle-wide image of the path ahead, effectively making the hood see-through. For more from Land Rover, click here. For a report from Fox News, click here. For a report from the New York Daily News, click here. For a report from World Car Fans, click here. This entry was posted in Business on April 10, 2014 by admin.